It’s 3:00 pm on a hot Tuesday in August and there’s a traffic jam outside Sieffert’s Farm Market. Two cars coming from the east and three cars coming from the west all want to turn into Sieffert’s driveway at the same time, and “traffic is backed up in both directions,” as radio announcers from the city say. It’s not what you’d expect on a sleepy rural road on the outskirts of Comox. There’s nothing special going on here today—just local fruit and vegetables for sale on a sunny summer day. Nothing special—but the place is bustling. A group of shoppers in bathing suits stand talking in the middle of the gravel parking lot while cars manoeuvre in and out of parking spots. Parents are telling their kids not to shout, not to run, and not to hassle them to buy more strawberries, apparently with limited success. A dusty tractor trundles by. Inside the market, a simple, rustic rectangular building, two line-ups of five or six people each stand at two tills, waiting to be served by the two cashiers, who are moving noticeably faster than anyone else in the room. The shoppers, on the other hand, appear happy to linger over the huge bins of corn and potatoes, the bunches of carrots and beets, the baskets of berries, the stacks of frilly lettuce, and more. The bright scent of dill envelopes me as I enter the market and scan the crowd. I’m here to get the story behind all this activity—the story of one of the Comox Valley’s favorite and most long-lived farm stands. Just in case the display of abundance and the crowds of eager customers don’t convince me of Sieffert’s popularity, a framed certificate on the wall confirms that it was voted Best Farm Stand in the Comox Valley Record’s Readers’ Choice Awards in 2015. There may be “nothing special” going on at Sieffert’s—there are no marketing gimmicks, no exotic vegetables, no trendy new products—but clearly, Sieffert’s does “nothing special” extremely well, and has been doing so for more than half a century. Charlene Sieffert, I’m told by someone busily unpacking crates of broccoli, is in the pumpkin patch. Char, along with her husband Bob Sieffert and their partner Chris Edwards, owns and operates Sieffert’s. I find her emerging from the sprawling pumpkin vines behind the market, and she bundles me into a pick-up to take me down the road. “We’ll go sit under the maple tree,” says Char, wiping her forehead with the back of her hand. The maple tree turns out to be huge and venerable, its spreading limbs casting shade over a weathered picnic table. The spot offers an iconic Comox Valley view—a panorama of fields spreading across the foreground and mountains spreading across the background. Bob Sieffert looks every inch the farmer. Tall and solidly built, he wears canvas pants, dusty work boots, and a baseball cap with a “Black Creek Farm and Feed Supply” logo. When I ask him to tell me the history of the farm he leans back in his chair and is silent for a long while, gazing out at the horizon. Finally, Char gets him started. “It was his parents, Jean and Norm Sieffert, who started farming here. It was in 1959,” she says, and pauses. The Siefferts slowly built from there, buying more property when the opportunity arose. “In ’68 they bought the market property and in ’75 they started the market,” says Bob. 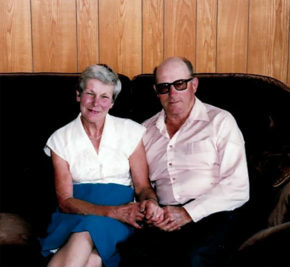 Jean and Norm Sieffert started farming the property in 1959. Photo courtesy Sieffert family. Today, the result of all that “plugging away” is an extensive farm business that employs 63 people at the height of its busy season. 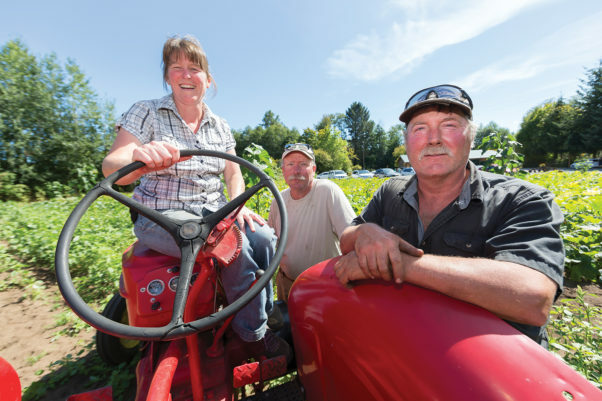 The farm includes multiple properties in Comox and one in Merville, totalling more than 300 acres, 155 of which are planted—90 acres of potatoes, 24 acres of corn, and the rest in mixed vegetables. There are 16 greenhouses totalling 30,000 square feet, and there is the retail outlet, which is open from June to November. As well, Sieffert’s ships corn, tomatoes and cucumbers all over Vancouver Island. The key to success for Sieffert’s has been “not jumping too fast to get too big too quickly,” Bob says. “You have to make improvements over time when and where you can. Bob was born into farming and has never done anything else. “I was born in 1963 but didn’t get put to work till I was 12,” he says. After he graduated from Highland Secondary School, he moved into farming full-time. Char came into the picture in 1984, when she took her first post-high-school job at Sieffert’s in the farm market. A year later she and Bob were dating; they married in 1988. In 1999 after Bob’s father died, the couple, along with Bob’s mother, realized they couldn’t handle the whole operation on their own. The solution to this problem was close at hand: Chris Edwards had been working on the farm since both he and Bob were 17. He was a good friend and he knew how the farm operated. He accepted the Siefferts’ invitation to come aboard as a partner and now the three of them work as a team. Sieffert’s is not a certified organic farm but it does use various sustainable practices, such as biological insect control (“good bugs eat bad bugs,” explains Char). “The market is continually changing. We have to respond to the wants of customers as they change over time. Five years ago we didn’t grow garlic,” says Bob. “Not that long ago no had heard of kale,” adds Char. “And now…” She trails off, clearly feeling no need to point out the current popularity of this leafy vegetable. 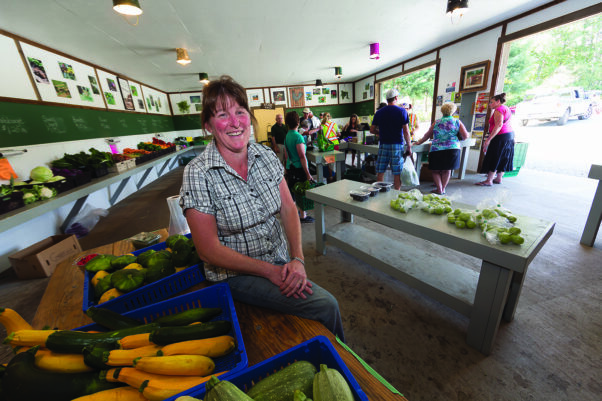 Family farming is not known to be easy, and Sieffert’s has faced some daunting challenges. In 1981, due to skyrocketing interest rates, the family lost two properties, which they worked hard to buy back a few years later. For the Siefferts, farming also brings connection to community. This starts with their staff. “A big part of why we can do what we do is our staff,” says Bob. Community also includes the Comox Valley. Sieffert’s is recognized for its generosity. We do lots of donating,” says Char. “Several soup kitchens come by regularly for produce, and we support quite a few community groups, service organizations like the Lions and Rotary Club, and schools. The soup kitchen is five days a week—they make good use of produce that is still good to eat but not good to sell. “It’s a way of giving back to the community that supports us,” she says. Clearly, 50 years of “plugging away” to provide safe, economical food can be a recipe for success. Sieffert’s continues to grow steadily. This year, that meant expanding the farm stand building and the parking area—the fourth renovation since the original 20×20-foot structure was built. By the looks of things on a random Tuesday afternoon, the added space is absolutely necessary. There aren’t many farm stands that can create traffic jams on quiet back roads, but Sieffert’s can. Perhaps Char is right, and there really is “nothing fancy” about what Sieffert’s does. But in its understated way, the farm has become a Comox Valley institution. Sieffert’s is one of more than 20 farms participating in this year’s annual Farm Cycle Tour Sept. 25. Click here for more about the tour. Sieffert’s is located at 720 Knight Road in Comox, past the Comox Valley Airport. For more information visit the Sieffert’s Farm Market Facebook page.